Literary elements at work in the story: The text is one of few words and lots of visuals. It is poetic to read but does not rhyme. It uses very descriptive language for each of the varied materials used in building a house. I believe the format of the book is beautiful and elegant. 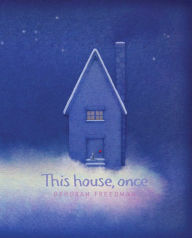 It seems to be a book that you would sit high on a shelf so your young child would not play with it or tear the pages. The artwork is skillfully done and wonderfully illustrates the author’s purpose, but it is somewhat bulky. The creator of the book has pages with words, and then larger illustrations on the following page without words. This makes for clumsy reading and lots of page turning, particularly if reading to a class, for example. How does the perspective on gender/race/culture/economics/ability make a difference to the story? This book presupposes that the reader will live in a well-built, stand-alone house. This is not necessarily revealed in the words of the story but certainly in the illustrations which the author also created. This certainly feeds into questions about how children would react to this story if they lived in an apartment building or a dwelling that was not well maintained or furnished. The book does not have images of people in it but rather lots of pictures of creation and animals. In this way, it highlights the author’s desire to bring an awareness to the reader regarding where the materials to build a home come from. Theological Conversation Partners: Theologically, this text may be a helpful one when speaking with older elementary age children about stewardship of resources. I do not think a child under seven or eight years of age would appreciate the illustrations or the lessons of the story. I think it could be used in correlation with an Earth Day lesson in a preschool setting or in church when learning about the story of Creation in Genesis. One might also reflect upon Jesus’ parable of the wise and foolish builder found in both Matthew 7 and Luke 6. One might also take an opportunity to explore the differences, or disparities between different dwellings—whether in their own communities or globally and what that means in partnering in mission and service. In Genesis chapter 1, God creates humankind and gives us dominion over all that God created. What does that word, dominion, mean? Does God give all of creation to humankind for us to use as we wish, or do we have responsibilities to God and creation out of faithfulness to God? In the gospels of Matthew and Luke, Jesus tells a parable that speaks of building a house on a firm foundation or a shaky one. Why would Jesus use a house as an example and what does it mean? What diverse kinds of dwellings have you seen in your community or in other places around the world? What could you do to make communities and home safer for people to live there? Thank you to alumna Loren Tate Mitchell, associate pastor at Covenant Presbyterian Church, Roanoke, VA, for writing today’s review. This House, Once by Storypath is licensed under a Creative Commons Attribution-NonCommercial 4.0 International License.